If you really think about it, we live in a world absolutely obsessed by value as understood by use and practicality. We find meaning in things that have meaning, but usually only in the most painfully logical, reasonable sense. I do this and you do that because yes, it’s so rational, and things add up so nicely. Our cars get us from point a to point b, and then get us back home again, safe and secure. But… why do we think this way? And is the truly most valuable thing that very thing that does not actually have any value? That adamantly refuses to add up? These are the questions that I’m most interested in at the moment, and I can’t help thinking that art, or truly great art, especially in our day and age, must be absolutely, 100 percent useless. It has no value, no great purpose, or really you could say it just sits there and determinedly stares at all of those other things that insist on doing something so practical and logical for us. Other things buy us things – whereas the type of art I’m talking about is great precisely because people can’t seem to sell it. It sits unused and unwanted in the shop store window, gathering dust. Of course, there’s nothing at all revolutionary or ground-breaking in this idea. It’s been around in various guises, this thought of uselessness versus purpose. Maybe we just need to be reminded of it? By far my favorite example of this determined uselessness comes in the 19th century in the figure of Oscar Wilde, and his flamboyant, extreme version of Aestheticism. I guess what I love so much about Wilde is the fact that he actually lived what he preached. The paper and his ideas came to life. He would deliberately shock crusty Victorian society, with its prudish ideas about morality, by living in excess, and as a true, flashy dandy. He believed that yes, art is truly beautiful for its own useless, purposeless sake. He talks most famously about this in his “Preface” to The Portrait of Dorian Gray. My favorite little passage is when he writes, “They are the elect to whom beautiful things mean only beauty.” Or, simply put, don’t destroy beauty and art by assigning them grand, all-encompassing purposes. Art “means,” even though it means nothing at all, simply art – and therein lies its supreme beauty. Divorced and unfettered from stodgy, boring uses. Follow this link to check-out the entire “Preface:” http://classiclit.about.com/library/bl-etexts/owilde/bl-owilde-pic-pre.htm. 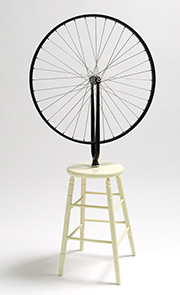 A Marcel Duchamp “ready-made” from the early 20th century. This also fits with Wilde. See how Duchamp “destroys” the use of the chair? But by doing this, he makes it a piece of beautifully useless art. 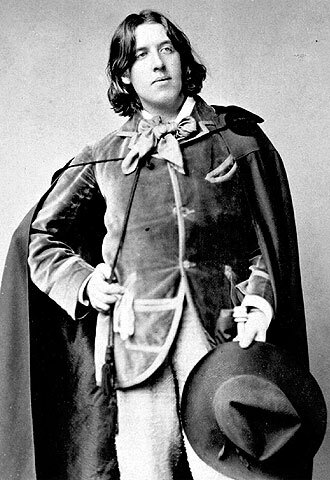 Now, I bring up Wilde, and I say that he is probably my favorite example of Aestheticism, and the art for art’s sake movement, largely because of the time period he worked in. The end of the 19th century was, in many ways, a lot like our own 21st century world. This was a time of extreme industrial progress, and the rise in the power and overall invasiveness of the machine in our everyday lives. People were falling in love with their machines, and anything that made their lives easier and more efficient became God-like and divine. Notice the world efficient? Efficient tools that helped us therefore had true value. They were the toys that kept us at ease. In turn, art, in this society, seemed truly useless. What a waste of time people would declare. Make more machines! That’s how we advance as a culture. What can art ever do for me? And so you have people like Wilde, and other dandy-like figures, resolutely taking a stand against machine-determined value. Beauty and art, they declare, is so important precisely because it is useless; or, at least useless in the eyes of the machine-minders and devotees of reason and the bottom line. They deliberately confuse these people. Throw wrenches in the machine for sport, and declare irrationality and beauty and art as the only truly free things. They remain outside of control. They cannot be equated. They do not add up, and it is precisely because of this stand against reason that people learn to fear them… largely because they don’t understand them. They rest outside our own grand, stabilizing equation, and, by so doing, reveal that it is in fact not that grand and all-encompassing as we had been led to believe. That which stands outside shows a gap in the center, a hole that we can’t quite fill up. At best, we can only look the other way, or convince ourselves that it somehow doesn’t exist in the first place. But that only lasts for so long. Art, then, or what I would argue as being truly great art, must be useless. It stands aside, and looks askew at a world that it fully understands, but refuses to take part in. Unlike so many other things, it protects its freedom.